Home > Apologetics Topics > Science and Faith > Does the Vastness of the Universe Argue Against Creation? Does the Expanse of Space Argue Against the Importance of Man? The Universe is very, very big: we are one planet amongst nine in the solar system, revolving around a star. This star is one of 200 million in a galaxy 100,000 light years across. Our galaxy is one of 100's of millions that exist or did exist in the cosmos. Even if we take a minimal approach, we can still see neighboring galaxies that man can never in all our existence ever visit, possibilities of hyperspatial travel in the far future notwithstanding. The nearest, Andromeda, is 2 million light years away. Our best guess is that the universe is 10-15 billion years old, notwithstanding relativity. Our own planet is something like four billion years old. I have always believed that the "six day theory" was not literal, and only stated as such so people of previous times could comprehend it. How can a "day" exist before the sun was even created? But if I'm off course, that's a whole different issue. I have already worked out that I'm sure a lot of folks disagree with; so let me return. Relative physics is in a nutshell (for this example) is that time is relative to all individual objects, and all objects in the cosmos are in motion; therefore my clock runs at a different rate than yours, and exponentially...time in a galaxy 100 million light years away will differ by hundreds of years from ours depending on mass, velocity, and direction relative to each other. In this concept I do understand that God transcends time, so this isn't a problem for me either...it's the age. 10 billion years, if that be correct, or for that matter just a million; is a terribly longer period of time than human history. I am no Biblical scholar, but as I understand it God supposedly created the stars for Man's benefit...simply in order to keep time. I have been unsuccessful finding anything else in the Bible stating God's purpose for the rest of creation. Given the vast scope of existence, this cannot be correct. Maybe this is true only based on what we have known for most of our history, such being the limits of our relationship with so much space we cannot ever hope to physically go. Maybe this was God's explanation to us, but not His only explanation, or maybe he was referring to just our own solar system. According to the above hypothesis about the nature and breadth of the Universe, Mankind is but a gadfly on a speck of dusk in an ocean of existence. Whatever one's beliefs, we have to admit there's a whole lot that God isn't telling us. He, I believe, left it up to us to discover. The most important aspect of humanity in relationship to God is not Mankind as a whole but each Man as an individual. This has caused great confusion throughout history; God certainly has a plan for human civilization, but does not "favor" certain peoples. We only live a short live span and the greatest minds among us can only comprehend so much; we can never hope to know the whole truth, only the truth as it applies to our individual mortality and salvation. This is what one has to keep in mind as the most important truth to one's self, everything else is of different importance. But God hasn't revealed his whole plan, which has to be much bigger than just us as a race or individuals. So how important are we, mankind, really? Life On Other Worlds, God's Other Children? I don't believe we have ever been visited by aliens. It's simply a question of statistical mathematics that a civilization within 10,000 years of our own technology existing close enough to us to visit is virtually impossible. The chances are just too small for the above reasons. But given those same above reasons of time and space, the likelihood of other intelligent life existing before, now, or in the future is plausible on countless other stars somewhere in the Universe. Could God have created other children in his image? I, for one, do not think so; but cannot say for sure. The Universe is just too big and old. This seems similar to questions of Christian Exclusivism, but doesn't quiet provide answers. Human perception is limited. Like I said before, we only live so long and can only know so much. The basic truth we need, that of our own salvation, is there. So as mortal humans we perceive the Universe within the limits of our own minds...how can someone who only lives a hundred years truly comprehend and relate to billions of years? How can one comprehend or relate to space that takes light millions of years to transverse? The scientific answers are easy, whether or not technically correct; but the philosophical ones, of vastly more importance, are much harder. So did God only reveal to us what is within the confines of our own perception? Would it be wrong to overcome this? I always say no, God gave us an inquisitive mind and it is not a sin to ask questions. But this also means discovering God's plan that has not been revealed to us, and most of those questions we have to answer ourselves, I think...thus the reason for so much debate. God's plan has to be bigger, much bigger, than He's letting on. So in summary my question is simply this...how important are we, really? Thank you so much for taking the time to write and for the interesting question that you posed. I believe many people have struggled with thoughts such as these and it is important to answer them thoughtfully and accurately. So, before we begin to examine your argument, let me see if I can sum it up appropriately. 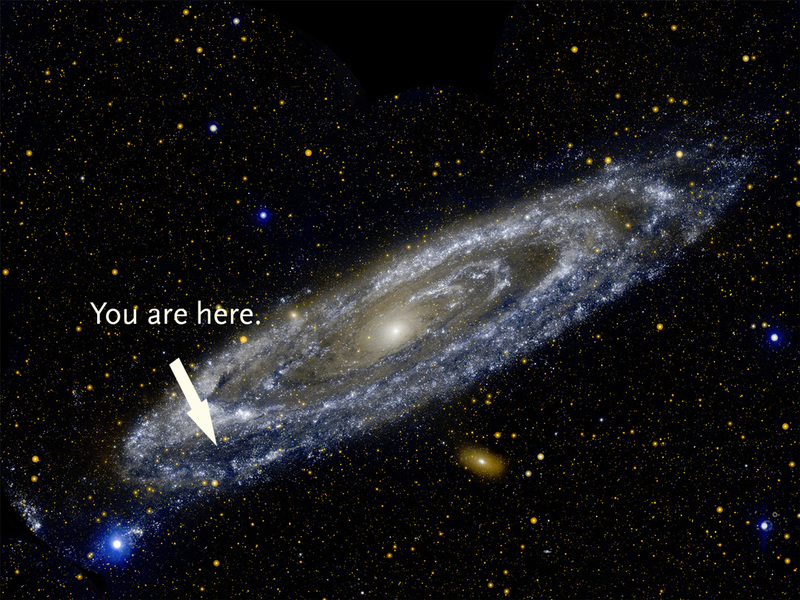 God created an incredibly big universe out of which humanity occupies only one tiny speck. According to modern scientific theory, God created this universe an incredibly long time ago and humanity has really only existed a very short time. Given #1 and #2, it should be considered likely that other beings may exist somewhere in the universe. God's revelation of Himself and His plan for humanity is very limited; by not only our time and location in space, but also because God has not revealed many things to us — both physically and spiritually. Instead, He left us to discover the intricacies of the universe for ourselves — and of that, we have only just begun to scratch the surface. Therefore, given the scope of his creation, our brevity and limited experience, the possible existence of other beings (either living now or in the future), and the lack of extensive revelation, one can easily argue that man isn't as important to the scope of God's plan for the universe as Christianity has traditionally positioned him to be. I believe that summarizes it appropriately. If not, please correct me. I will say that even if I grant all of the premises you offer in your argument above, the conclusion does not necessarily follow from them. In fact, I think I can build an argument that would come to the opposite conclusion: that reasons 1 - 4 above argue that man indeed is the most important thing in the universe. Let's take each point and see if they lead to another line of thinking. I don't believe your first point is very controversial. Most people accept that the universe is incredibly vast. I don't believe most people truly comprehend exactly how vast it really is, and I really include myself in that category. Human beings, being visual, will try to form a picture of this empty space. However, this is hopeless as we cannot compare anything to all the emptiness that's out there. So, we agree that there is a vast universe in which man is, as you put it "but a gadfly on a speck of dusk in an ocean of existence". However, it is a fallacy to say that the size of something determines its worth. For example, I can have a truckload of gravel, but it wouldn't come close to the value of a single clear diamond. In fact, the worth of the diamond is measured partly because it is so rare. Since these diamonds are so valuable, mining operations dig through tons of relatively worthless rock, moving them out of the way in order to get to the treasure. In the second point to your objection you say that the time the universe has existed much longer than the history of man, and from this you seem to imply that this point also argues against man being the focus for the creation of the universe. Even assuming the current estimates for the age of the universe (which most astronomers believe is between 13 billion and 15 billion years), I again say that it does not follow that man wasn't the motivation for God's creation. Just as I argued in the section above, taking a long time to prepare for a specific event can be an example of the importance of that event. I know many people who prepare for their wedding day—a 40 minute ceremony—for 18 months in advance, working on all the details to ensure that everything's perfect. Why do they take so much time and start so early? Because it is a very significant event and they wish to ascribe proper value to that event by putting everything in order first. Now, you may argue at this point that God doesn't need the "prep time". He could have done it immediately, and this is true. However, perhaps the time may have been necessary for us to properly understand Him. The Bible does tell us that God set stars in the heavens for signs. These stars, being very far away, would need a certain amount of time for their light to get to earth and be observed by man. Further, things like oil require time to form so that we can use it. This can be considered all part of God's plan for human history. Without oil, plane travel becomes impossible. Without plane travel, many modern evangelism efforts could not exist. So, I think even if one holds to an old universe, it in no way diminishes the idea that the universe exists as an example of God's love for man. Your next point draws a conclusion that given the vastness of space and the length of time the universe has existed, one cannot assume that man is alone in the universe. I don't believe this point follows given the arguments I've laid out above. Scientists and mathematicians argue that the odds of intelligent life anywhere other than earth is so remote that it can be considered absurd.4 Others, like Carl Sagan, searched for it through the SETI project. (For more on this, see a recent newsletter article I wrote on the subject.) However, since it is impossible for us to observe all the areas of the universe to be sure, we can't draw a strong conclusion either way. Our scientific knowledge is just too limited. So, what we must do in these instances is look to Scripture. God revealed that He created the heavens and the earth and that He made man in His image. (Gen. 1:28) The idea of man being made "in God's image" implies that man is a rational creature, able to understand the concept of God, of good and evil, and to choose whether to follow God's laws or his own desires. Further, we know that God created other beings that have some similar characteristics. Angels are characterized in the Bible as sentient beings who know and understand God's will. They abide in a spiritual plane of existence, although they can appear physically if God desires.5 In fact, Hebrews tells us that man was made "for a little while lower than the angels" (Heb 2:7). So, in one sense, we can say that other beings do exist in the universe. However, there are marked differences in how God deals with man and how He deals with beings such as angels. For example at some point in the past, a certain number of angels decided to rebel against God and His laws.6 In choosing to follow Lucifer, they became accursed and were condemned to a destiny of punishment for all eternity. With man, though, the situation is different. Since man's domain is the physical universe, when he chose to rebel. It had an effect on the entire universe. Romans 8:22 says "the whole creation groans and suffers the pains of childbirth together until now" meaning that Adam's sin effected all of the physical universe. But God does not condemn either man or His creation to an eternity of misery. He provides a way of escape in His son, Jesus. In order to become the savior who would set all of creation free, Jesus needed to become a man to pay the penalty for Adam's sin. This is why the Bible calls Jesus the "second Adam". God's law required a kinsman redeemer— a man to pay the price that each of us cannot pay. So if there are beings on other planets that are capable of free will decisions, they are part of the fallen creation. And since Jesus came only once to save all, the beings on those other planets would need to believe in a savior that came to our earth in the form of a human being and paid the sacrifice here. This is why I feel that it is doubtful that such beings exist on other planets. But when we also consider one more fact, we can see just how important man is. Point number four above argues that since man's level of comprehension is so limited that it makes things very difficult for us to grasp the great truths of the universe. However, as you correctly pointed out, God has revealed Himself to us through His word. In fact, He has done even more than that. God reveals Himself to us in His Son. The fact that Jesus lived as a man among us communicates more powerfully than anything else how important we are in God's economy. In Jesus, we have a perfect message of God's love and His desire to save us from our sin. All of the above points show the special care that God took throughout creation and throughout history to accomplish a single purpose, to have a holy relationship with mankind. Jesus died for that. He lavishes us with creation, with our ability to explore it and learn from it and grow. Moreover, He lavishes us with the revelation of Himself, where in eternity we can continue to learn of Him and grow closer to Him. We learn from the Bible that when God finishes His plan of redemption, we will be with Him forever. The heavens and the earth were created by God's word and they will be recreated again (Rev 21:1). But every person will have an existence that continues into eternity. As I survey all the points above, I feel that they lead to one conclusion: that God loves humanity so much He would set things up perfectly so we can thrive. I love my wife. Because I love her I like to spoil her from time to time. It makes perfect sense that God would set up the vastness of the universe for no other reason than to make everything just right for us to know of His love. Psalm 19 says "The heavens are telling of the glory of God; and their expanse is declaring the work of His hands". If our universe is that big, then just how much bigger would God have to be? I hope this has given you another perspective on the creation. May He continue to bless you as you seek out His face. 1 Barrow, John D. "The Great Basilica of Nature" Science and Theology News, March 15, 2006. Accessed at http://ezinearticles.com/?The-Great-Basilica-of-Nature&id=177024. 4. See William Dembski's chapter entitled "On the Very Possibility of Intelligent Design" in The Creation Hypothesis, J.P. Moreland ed. 1994 Intervarsity Press, Downers Grove Il. 6. According to Matt 25:14, Hell was created "for the devil and his angels".